As the year was coming to an end, Pakistan (parts of the country) experienced the coldest December in 30 years. The country witnessed a quick transition from a long hot October to early mild cold November however the southern parts of the country experienced their first share of cold during the mid week of December. October 2013 was the hottest month in the world since 1880. Western disturbance: These systems have the potential to cause heavy precipitation with strong winds gusting to 100 km/h or more, they could cover whole Pakistan depending upon their intensity. It is major non-monsoon weather system in the northwestern sub-continent. Fog: It mostly affect the plains of Punjab, Khyber Pukhtoonkhwa, Balochistan and adjoining Sindh, depending upon the prevailing conditions, fog could turn into the most threatening source of traffic accidents in the country. It rarely forms over coastal Pakistan. The 30 year old minimum temperature of December was broken in parts of Balochistan as the temperature dropped to -15°C in Kalat while it dropped to -13°C in the provincial capital Quetta due to the Siberian anticyclone. Miranshah, North Waziristan saw first snowfall after after five years. The lowest temperature of December −2.8 °C set in 1984 has been broken after 29 years in Islamabad as temperature was -3°C on December 30, 2013. The lowest temperature ever recorded in Islamabad was 46 years ago in January 1967 when the mercury fell at -3.9°C. Karachi is crystal ice since three days! Since December 27, the lowest temperature in Karachi has been 6°C which can drop to 4°C/5°C on December 30 night and December 31 night. 6°C is nothing to be amazed in Karachi as almost every winter similar temperature has been recorded in the city for example the latest years being 2010 and 2011. The minimum temperature recorded in December in Karachi was 1.3°C in 1986. A western disturbance would affect the northern areas of the country on December 30 night and December 31 that can bring showers/rain to Islamabad, Azad Kashmir and adjoining Khyber Pakhtunkhwa and northern Punjab (Murree, Rawalpindi and few adjoining cities). Slight chances of drizzle/isolated shower in north-eastern Punjab (Lahore, Sialkot, Gujranwala and few adjoining cities). 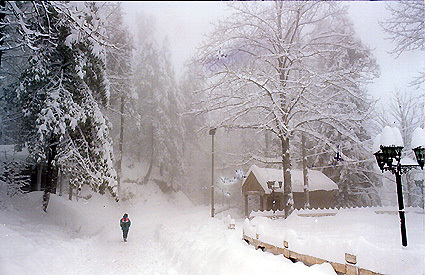 Snowfall can also occur over the mountainous areas of Gilgit-Baltistan , Azad Kashmir and adjoining Khyber Pakhtunkhwa. In Pakistan, winter 2010-2011 and 2011-2012 were affected by La-Nina while 2012-2013 was affected by the ENSO neutral conditions. It seems like that winter 2013-2014 would also be affected by the ENSO neutral conditions. During the last days of December (severe cold wave can continue can continue till first week in the north) many parts of the country have witnessed chilly temperatures and no ‘proper’ winter spell occurred in any part of the country. On December 27 status, The Portal said that a proper winter spell can occur in the country around the mid of January. The winter wet spell would be below normal in the country however it can be near normal in northern Balochistan, Gilgit-Balistan and adjoining Khyber Pakhtunkhwa & Azad Kashmir. The winter wet spell can be above normal in Jammu & Kashmir. Temperature-wise winter can be intense but short, one to two severe cold waves are also likely in January while one cold wave (not severe) can occur in February. 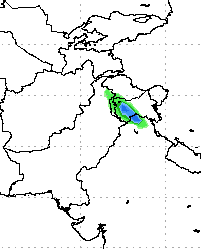 (PWP will issue a second outlook on January 15, 2014 where this forecast would be revised or remain unchange). in south punjab more rainfall will come in january or february of 2014 what do you think? Climatically February is slightly wetter than January. When will started winter proper rain in swabi,kpk? Around Mid of January, there are chances of proper rain in the country. such as on januray 4th – 2014 , Earth will reach the closest point to the Sun. Very nice and detailed analysis babar bhai but winter rains forecast for south punjab is missing in the article. Below normal rains for south Punjab. Bro how are you kindly tell me when we receive first rim jim of 2014 in Hassan Abdal. I think today it has rained in the area. This weather would prevail throughout the day..
very useful analysis sir,,i think since last 3,4 years islamabad is witnessing more rains in february than in january, what is the forecast for rain in islamabad in the month of february?? Two or three spells of rain can occur in Islamabad in February. when will rain begun in multan? Admin plz tell me is there any chance of rain in the month of January in Rawalpindi division.. I think rain did occur in Pindi in January, first week of Feb can witness good rains. The record for Islamabad was not broken. The temperature was rounded off to -3 C, but in fact it didnt dip below -2.7C at Zero point.